We are a West Yorkshire based toolmaker providing new tooling and modifications/servicing of existing tooling. Originally formed in 1988, KPT is a privately owned precision toolmaker specialising in the production of tooling for the plastics injection moulding and die casting industry. Our services also include the supply of jigs, fixtures and individual or multiple precision engineered components. Our capability is based around the skills and experience of our Technical Engineering department, our highly motivated Production Tooling staff and a full range of advanced manufacturing equipment. 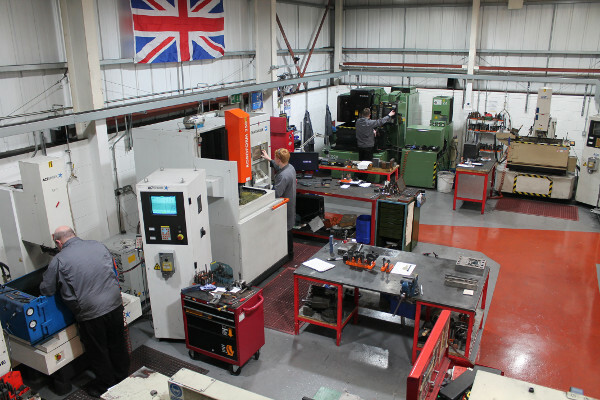 Our in-house toolmaking facilities include CNC machining, EDM die sinking and wire cut machinery plus a full range of ancillary equipment to ensure we can service all our customers’ needs. Whether the requirement is rapid prototyping, product replication, product development or toolmaking, we can assist. With our knowledge & experience we are able to advise and develop the most appropriate solutions to meet our customers’ individual needs. Our in-house technical team work with customers to design and manage projects from start to finish ensuring complete confidence and knowledge is up to date at all times. By doing so we are able to assist customers in product design from conception to production. We have built a reputation as a toolmaker, for quick responses at a competitive price with our customer being consulted and advised of all options available to maintain costs and timing. Our long-term plans for constant improvement to newer and better CNC machines, equipment and software mean we always maintain the emphasis on quality and efficiency. Now operating from our new toolmaking facilities in Huddersfield, West Yorkshire, we can offer 10T handling capacity for commissioning of LCC tooling, tool repairs and modifications. Our current in-house capacity for tooling made 100% in the UK is up to 2.5T. We have access to full Moldflow analysis and additional design resource through our sister company should your project require any of these services. With the latest digital printing, either by FDM in house or multi material polyjet FDM through a trusted partner, we can also offer the very latest 3D printing and scanning technologies. Whatever your requirements are, we can help. So why not get in touch, we will do all we can to assist you with your business needs.